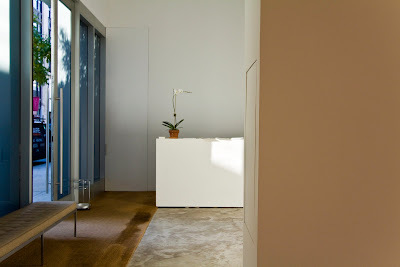 This is looking into the entrance of Cheim & Read from the room where I clandestinely took photographs. And finally, I made it outside, and took a proper STREET photo. This is, uh, the Cheim & Read Gallery. 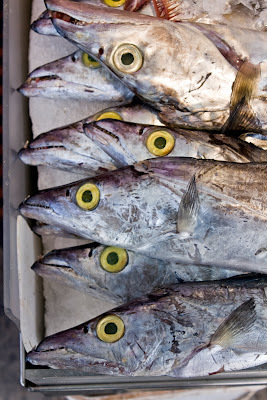 I really don't have any particular fondness for this gallery, I just liked these photos. Really. I had a decision to make tonight. 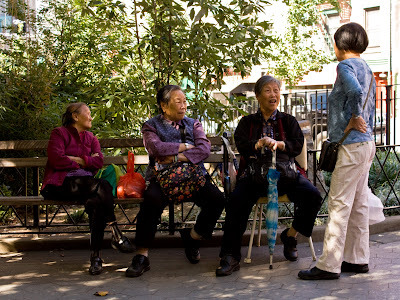 Whether to continue with the 3 remaining walks from the Civic Center/Chinatown area (the reason for so many walks is because I did Grand Jury service for four weeks) or to go with a walk I did today in Chelsea. So Chelsea won, but now I have to figure out what to do about those three, now old, walks. Maybe it'll come to me in a dream. 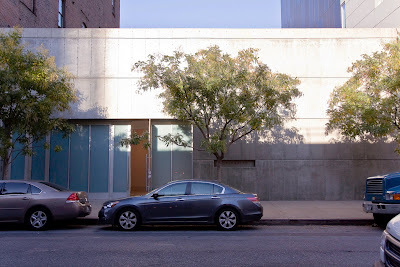 But for now, why I was in Chelsea is because I volunteered to do data entry for Open House New York and their office space is at 555 West 25th Street. I did it from 1:00 to 3:00 and then stopped because I couldn't enter another piece of data without screaming. They understood. Some day I must talk to you about Open House, but not now. So off I went to check out a few exhibits, but mostly to walk. The day was nice, a proper fall day, around 60, I think, sunny and breezy. 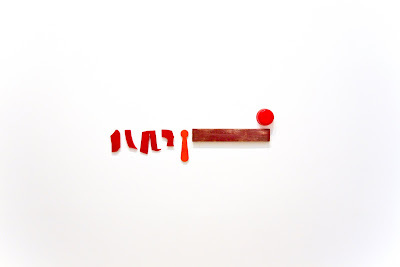 This show of Jack Pierson's abstract sculptures is at Cheim & Read through November 14. I showed you the top photo, so you'd get a sense of the size of this piece. 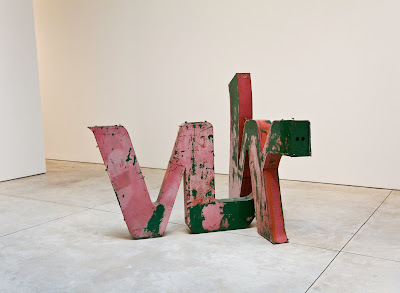 The sculptures are made mostly from broken up signs, plastic and metal. 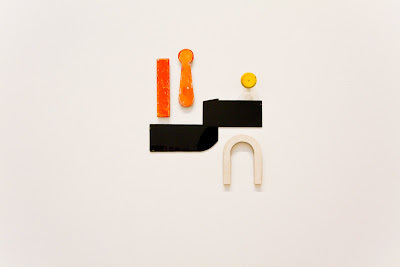 I'm leaving the enlargements extra large on the indiividual pieces so you can see the materials. I didn't like all of them, but I do like these three I'm showing you. Although now that I look at this one some more, I wonder if it isn't too perfect. I think I mean too facile, too slick, something like that. 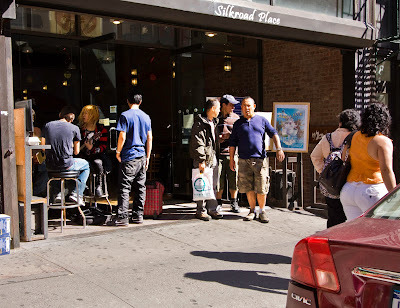 Go to Yelp to read 19 reviews of Silkroad Place. Okay, don't go, I'll just report what they say. The food is okay at best, basically tea and other drinks and sweets, but there's something about this place . . . the ambience, or the friendliness of the waiters, or, or, oh yeah, they have internet access out front. Yes, outside the actual restaurant! If that doesn't hook you, I don't know what would. You see that clump of kids to the left? Can you make out the guitars? I don't know whether they're there because of the internet access (but why?) or because of the stools. They weren't performing. Kids. Who can figure. And now it's still not time for lunch. About 25 more minutes. Just about enough time for a nice foot massage. 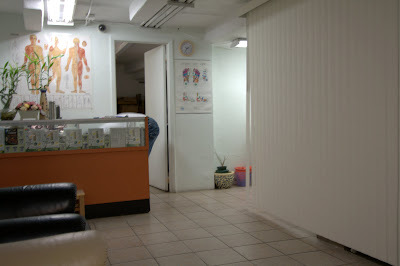 The ready availabilty of cheap foot massages just when you need them is one of the things that makes New York great. Ten minutes for ten dollars. Plus tip. In this case, the reclining chair was almost as great as the massage. And now to Nice Green Bo, formerly New Green Bo. Myra was already there and we lost no time in ordering. Pork and crab soup dumplings (they call them tiny buns), shrimp fried in their shells, and sauteed pea shoots, one of my favorites. The dumplings were great. You know soup dumplings? Where the soup is inside the dumpling. 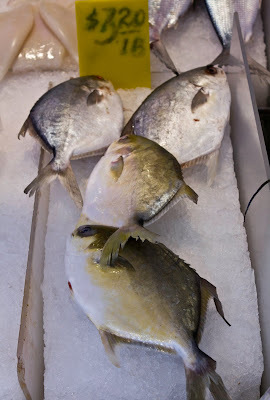 Bill and I trekked out to Goody's in Queens quite some time ago and had them for the first time. This was before they existed in Manhattan. Those were the pioneer days, kids. Anyway, we realized we had found something way worth the trek. Later Goody's opened a branch on East Broadway. Shanghai Joe's dumplings got all the buzz, but I thought Goody's were better. I was just going to lament the closing of Goody's in Manhattan when I saw a notice that they'd reopened on Fulton Street. Must check out. Anyway, back to Nice Green Bo. I didn't much like the shrimp because of the too sweet sauce they were in. Myra begged to disagree. We both thought the dumplings and pea shoots were wonderful and thought we should return and try other things. And now this walk is OVER. At last. P.S. Apologies for the last two inadequate photos. When I start to actually have experiences, I tend to lose my dedication to the Project. If you go to Google maps, street view, you will see a full photo of Green Bo when it was New, not Nice. 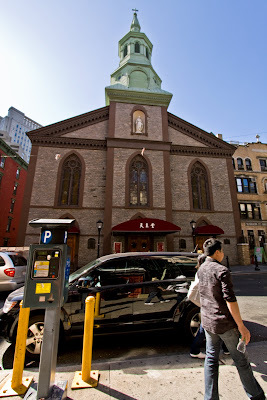 The Transfiguration Church was built in 1801 and has been a church for immigrants, first Irish, then Italians and finally Chinese until now it is the largest Chinese Catholic church in the country. 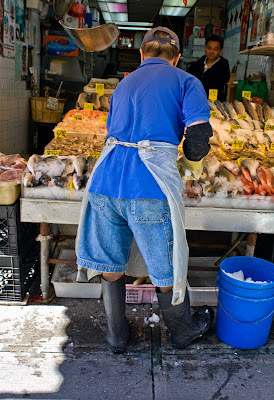 Services are conducted in English, Cantonese and Mandarin. This New York Times story from 2007 has some background. Do you notice those two little blemishes by the tops of the windows? By magnifying the photo I was able to see that they are strung on a wire that's running across the street. One looks like a tiny sock. I didn't notice them at the time. Just something I thought you should know. 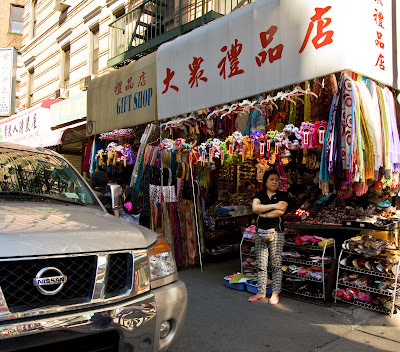 Starting up Mott Street. Remember when the weather was really warm? What happened to summer? 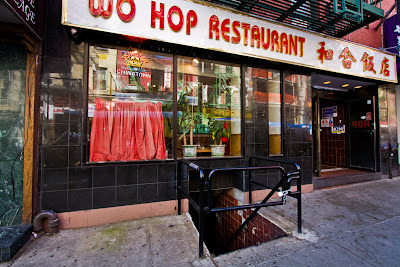 I was reading up on Wo Hop; New York Magazine says it's old-fashioned Cantonese (chow mein and egg foo yung), but good and comforting, and its readers (4) gave it a perfect 10, which I have never seen before. But then it seems that the Wo Hop they're talking about (established in 1938) was down the stairs you see there. 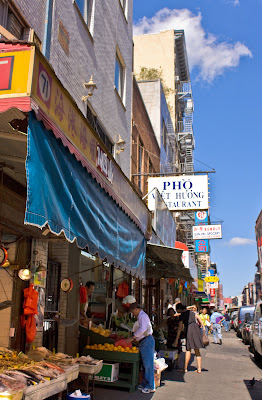 Revel in New York says we mustn't confuse the Wo Hop at 15 Mott Street with the Wo Hop at 17 Mott Street. Can't imagine why that would ever happen. 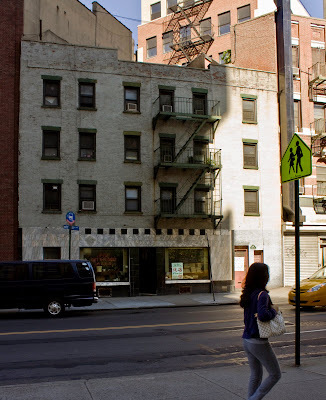 Anyway, click on the link and you'll see the entrance to 17 Mott Street. Now look back at this sad sight. Did you ever see anything that looked more closed? Here's Robert Chin's photo showing this site in October 2007, two years ago. Check out his interesting website. 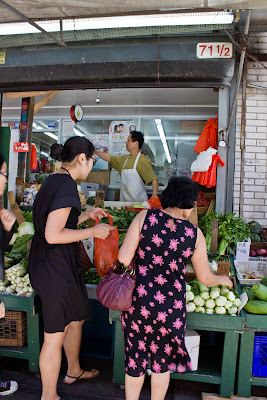 All things Chinatown. Don't think, however, that the 1938 Wo Hop closed the downstairs restaurant and moved upstairs. There are too many references to there being two of them. I'm not satisfied. Nothing will do but I have a meal there and ask a few probing questions. Can't you just imagine those waiters having a long chat with me? In other news, it seems I must apologize to a bank. Could anything be more galling? Citibank did not build that glass building we saw last night. According to the Songlines website, a Hong Kong businessman built it as office space around about 1979. A Chinese person built it. Okay, I'm sorry. Worth Street to Mott. That's ABC Florist across the street. 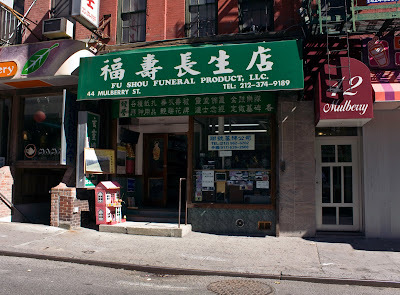 Remember, it's just around the corner from three funeral homes. Uh, oh. 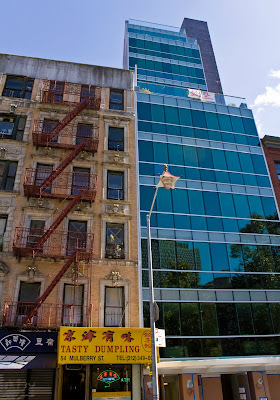 Another glass building in the middle of Chinatown. Dr. Toothy's bad enough. It does look nice against the sky, but that's no excuse. The culprit identified. CITIBANK!! Bankers are so evil. I mean banks. NOT bankers, banks! Now I've walked back down Mulberry Street and here at the end of the block is the True Light Lutheran Church. Their website is worth a look, as they have a history time line with links to old photographs. 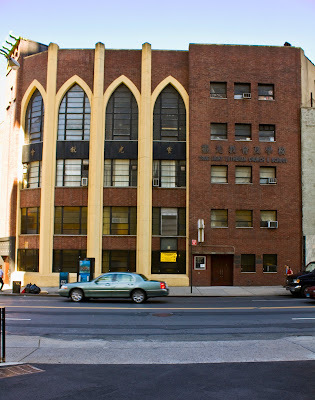 They began life in 1935 as True Light Mission with rented space on Canal Street. If you are unclear about what a mission is exactly, this link should clear it up. Basically, it's size. Before you have enough of a congregation to support your own church and pastor, you're a mission. So that's why we think of converting people when we think of missionaries. They're trying to get a church together. They must have succeeded because in 1949, they're building the church we see here. The New York Times had notice of this event with a drawing of the proposed church. It's grander than the actual built church and has a pagoda-like topping of the tower. Too bad. This looks pretty clunky. There are two services every Sunday, one in English and one in Chinese. Here's a closer look at some of that food. 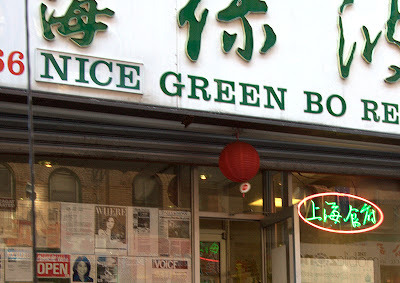 Just to remind you, I'm on my way to meet Myra at Nice Green Bo on Bayard Street. Since I still have over an hour, my plan is to walk Mulberry up to Canal, then walk back down to Worth Street, and over to Mott. So now, it's back to Mulberry. 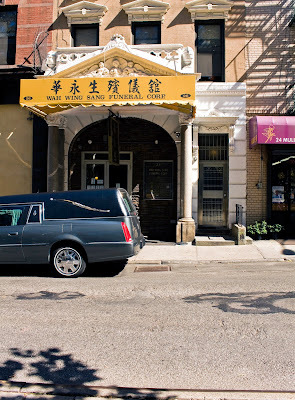 Enough with the funeral homes. 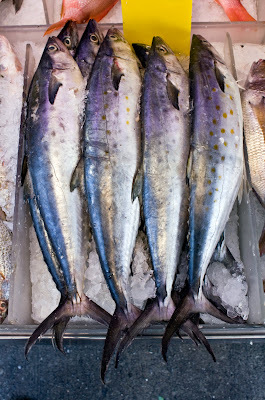 Let's visit some markets. Food for the living. Meanwhile on the other side of the street, from Worth to Bayard, is Columbus Park. We've been here before and I won't repeat myself, but in case you've forgotten, here's the link. I told you it was a beautiful day. Isn't this pretty? I sat on a bench for a while, watching people. The task of putting a small contemporary hotel in Chinatown was an opportunity to demonstrate taste, creativity and sensitivity. This builder decided to demonstrate vulgarity, a dead imagination and total indifference to surroundings. I condemn him. Or her. And you know I love glass buildings! It has no name yet. See the banner toward the top? Enlarged, it reads, Hotel Opening Soon. No name. I guess that means they don't have an occupant yet. Good. May they never. Oh, I'm bitter this afternoon. Wait! I just found out the architect is Chinese! Or at least it's someone with a Chinese name: Jung Wor Chin. How could you, Jung Wor? 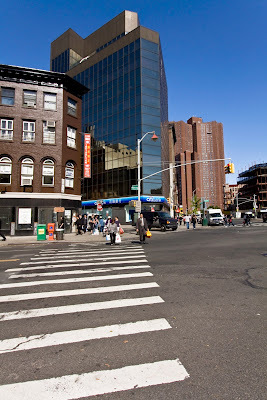 The Javits Federal Building is reflected in the glass. On a happier note, consider Tasty Dumpling. The web is 100% positive about Tasty's dumplings. Here's just one review. I am promising myself to have a tasty dumpling in the near future. Well, not just one, probably. 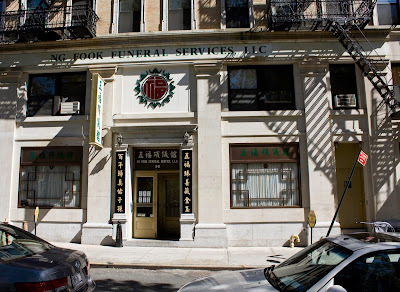 I asked you to remember those two funeral homes from last night's post until tonight, but now I have to ask you to remember them one more night. Why? Because I'm too tired to do the rest of this post. I'm only human, after all. That's Sam's Deli on the corner and he promises it's a traditional deli. And now up Mulberry into Chinatown. You won't be able to read this even if you enlarge, but the sign on the green canopy on the right says, Chinese Wah Lai Funeral Home. Same block. This one you can read. Now remember these until tomorrow. 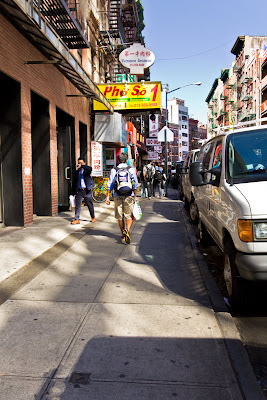 This is Mosco Street, one block long, and that's Mott street at the other end. 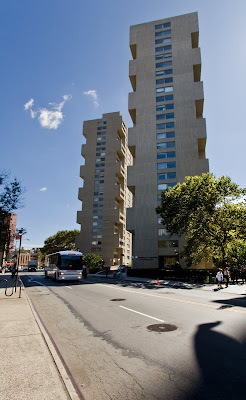 These are Chatham Towers, first glimpsed last night, built in 1965 and causing quite a sensation at the time, being New York City's first residential buildings made of poured concrete. 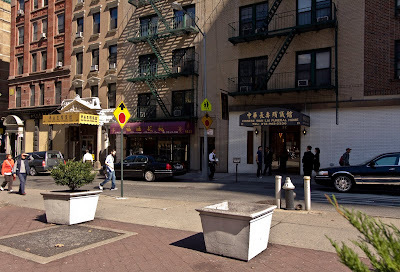 They were designed by Kelly and Gruzen which also designed Chatham Green, the "undulating wall of Chinatown." 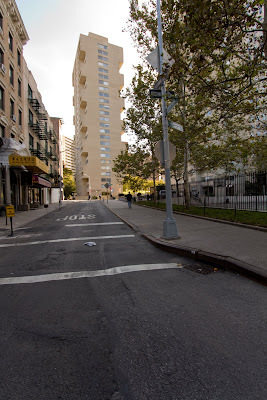 Here is a view of one of the towers looking down Mulberry street. This photograph is taken from a later walk, October 6, but I thought it belonged here. On to Chinatown. Worth Street divides Chinatown from the Courts, but farther east, beyond where Worth Street ends at Park Row, Chinatown has expanded a bit south. 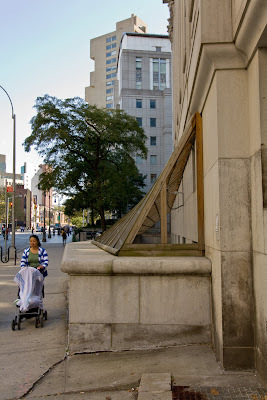 This is the side of the NY County Courthouse and straight in front of us is a wing of the Moynihan Courthouse and beyond that – the building with the strange juttings – is Chatham Towers, of which more later. On to Hamill Place. There are many cops standing around the streets down here and they are not resistant to having a conversation with a passing civilian. So I soon discovered that some years ago, they created a park in front of the courthouse and made Hamill Place into a pedestrian walkway. Right here. It used to be used for parking. This is nicer. 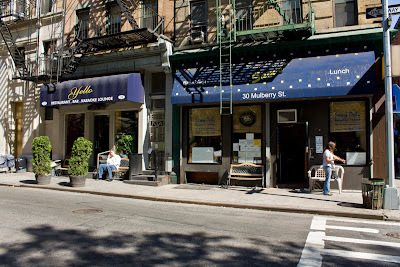 Oldstreets.com tells me Hamill Place was closed "about" 1990. My cloudy day Tuesday walk is over; now it is a few days later, Friday, September 25, sunny and beautiful, nothing to do but meet Myra for lunch at Nice Green Bo in Chinatown at 3:00. Geoffrey at work recommended this restaurant and he's Chinese. It's only a little after 1:00 now and this is my plan. First I want to find Hamill Place. It's on my map (it's an old map), but doesn't seem to exist where it's supposed to be, that is, a little diagonal street that cuts through the corner of Worth and Center by the Courthouse. Then I'm going to walk across Worth to Chinatown, then Mott to Bayard where Nice Green Bo is. But first, catch this wedding party in front of the Courthouse. 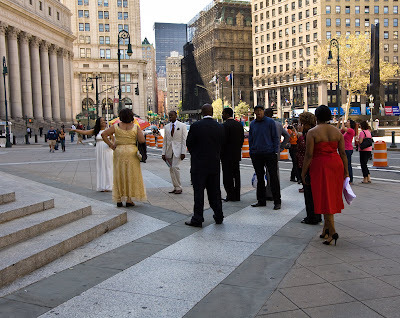 I didn't realize that people dressed up like this when they got married at City Hall. But wait! Look at what I found. In January, the new glamorized marriage bureau opened in a new space with actual wedding chapels painted in lovely muted shades. Bathrooms with vanities and full length mirrors for preparation, all kinds of amenities. The mayor wants New York to be the wedding destination of the world. The cost is $25. Go here for photos. 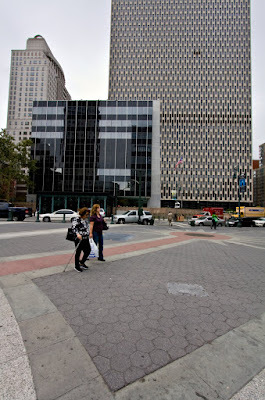 The new address is 141 Worth Street which seems to be the same building as 80 Centre Street, which is where I go for Grand Jury duty. I'll have to check that out Tuesday when I go back for my last day. Last day! I'm not ready. In other news, there's a new photo of me at the top. The old one was from a few years ago, now my hair's different, I have new glasses, I'm older. This one was taken in June this year. 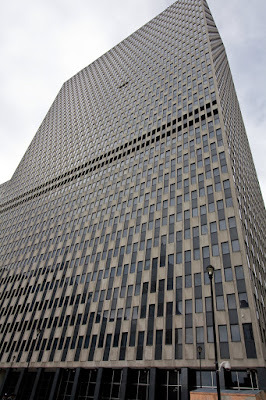 Now it is time to consider the Jacob K. Javits Federal Building. Here is a truly ugly building, although it's hard to tell just how ugly it is at this reduced size. Its surface is the problem. See? The architects (Alfred Easton Poor, Kahn & Jacobs, Eggers & Higgins) were probably just as horrified as the rest of us when they saw what their design looked like full size, but by then it was too late. This was built in 1967 which explains a lot. Some of you will remember the saga of Richard Serra's Tilted Arc, installed on the plaza in 1981 and removed 8 years later. 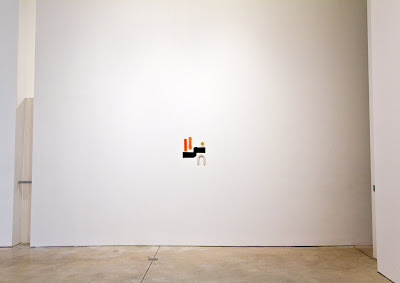 It was quite controversial, with art lovers on one side and the rest of the world on the other. The rest of the world won and it was removed in 1989. I regret that I never went down to see it while it was there. It seemed so far away in those days. And I had a job. Tilted Arc was the opposite of Triumph of the Human Spirit. Triumph is bad art but good public art and Tilted Arc was good art and bad public art. I wonder if it's possible to make good art and good public art. Wired New York has everything you'd ever want to know about Serra and Tilted Arc and the Plaza and what it looked like then and what it looks like now, with photos, so that's the only link I'm going to give you. 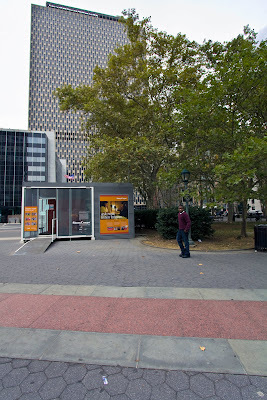 The only thing that looks out of place here in Foley Square is the orange rectangular box plopped down there. But its heart is pure, so I'll overlook its clunkiness. Here's a closer look at it. StoryCorps. You make an appointment, go down there with someone old (enough to have a lifetime of memories) and ask them questions. It gets recorded, you get a CD and a copy is stored at the Library of Congress. A good idea indeed. This is Triumph of the Human Spirit, a sculture created by Lorenzo Pace dedicated to all the unknown enslaved Africans brought to this country. 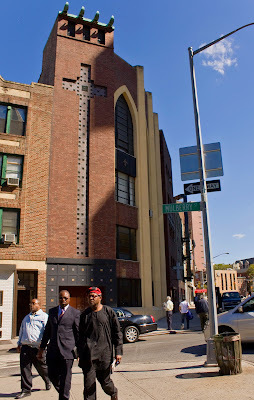 This is in connection with the African Burial Ground a couple of blocks away. I was looking for an art critic's assessment of the sculpture and found this article about skateboarders loving the granite "ramps" spaced around the base. The Times interviewed someone here from San Francisco who said Foley Square is well known in California. It's featured in skaters' magazines. Lorenzo Pace is not amused. 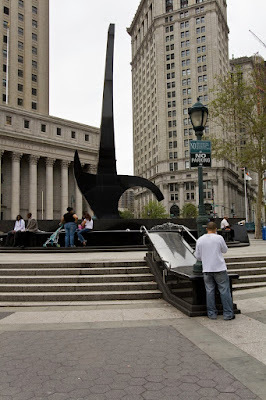 As for art criticism, in a longish article about public art, Michael Kimmelman said that the sculpture is successful public art in that people enjoy the fountain, but that it is "formally weak and unprepossessing." Good public art, bad art. I think we need a break. Enough with the gray buildings. A little color is in order. That's the bottom of the Javits Federal Building there at the top. This is the U.S. 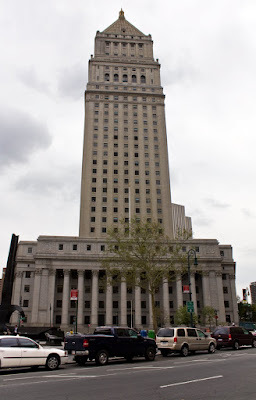 Courthouse, built by Cass Gilbert during 1932-36 in a neoclassical style, about 10 years after the New York County Courthouse was built. He went from neogothic (the Woolworth building) to neoclassic in one lifetime. Moreover, this was one of the first federal skyscrapers ever, so I guess we could call it neoclassically clad modern. No! Don't listen to me. Rather go to the GSA site for lots of good information about the courthouse. By the way, it was renamed in 2001 for the late Supreme Court Justice, Thurgood Marshall, so it's officially the Thurgood Marshall U.S. Courthouse, but I don't think anyone calls it that, including, obviously, me. I apologize for missing a couple of posts lately and will make up for it by flooding you with photographs and extra posts. How's that? Part of the problem is there's so much down here. So much history – everything has a story. For example, tonight I'm going to concentrate on Foley Square. 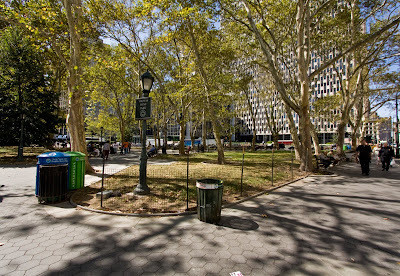 Within Foley Square is Thomas Paine Park. I could talk about Thomas Foley, Thomas Paine, or the sculpture, Triumph of the Human Spirit. I could talk about the old Collect Pond which was originally on this site or I could talk about the infamous Five Points, which was built over the drained Collect Pond. 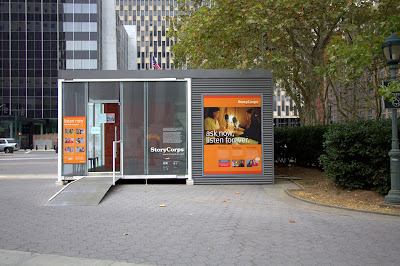 I could talk about The Story Corps, also located on Foley Square. It's dizzying. Tonight I'll just talk about a few. 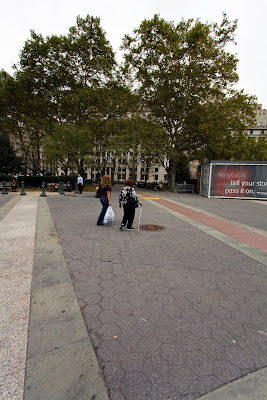 Foley Square is a big paved space bounded by Centre, Lafayette and Worth Streets. It is not square. 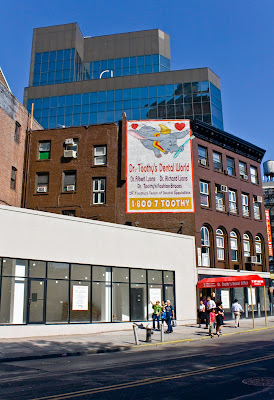 In 1926 it was named for Thomas Foley, a Tammany Hall leader and saloon-keeper who had died in 1925. Strangely enough, I couldn't find much of anything about Foley on the web, but I went into the NY Times archives and found this about his funeral. Take a look; it has Governor Al Smith going unescorted, just walking down the street like any other citizen. 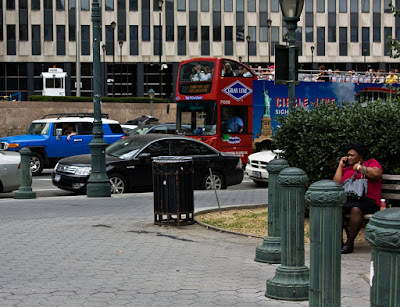 This is the north end of the square, looking south-west, and it was obviously taken on a different day than the rest of the Foley Square shots. A nicer day. 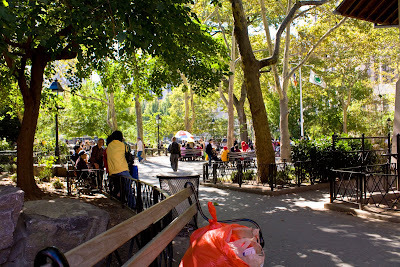 The sign says Thomas Paine Park, named for the great and important patriot of the Revolution. He said, "My country is the world, and my religion is to do good." Well said, Tom Paine. This is looking west toward the Jacob Javits Federal Building. Another reviled building, about which more later. 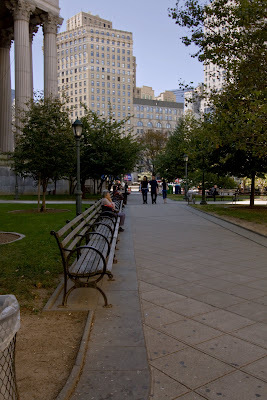 And this is looking north, back through the Thomas Paine Park and toward 80 Centre Street where the Grand Jury meets. Last post showed you the Square looking east toward the New York Supreme Court. We're back at Foley Square now. 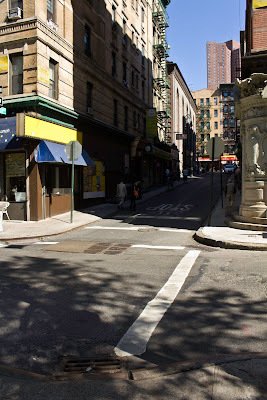 I forgot to mention last post that Pearl Street stops at St. James Place. It picks up again farther downtown, but that's for another walk. 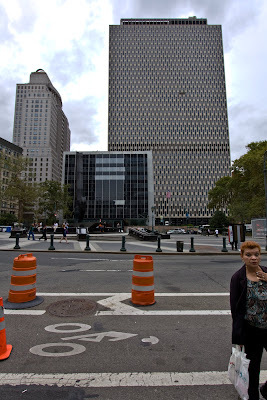 This is the New York County Courthouse, also known as the New York State Supreme Court. Unlike the Federal Supreme Court, which is the highest court in the nation, the New York Supreme Court is not the highest Court of the State. The first meaning of supreme is highest in rank or authority . . . the second meaning is of the highest quality . . . importance, etc., the third meaning is greatest . . . and the fourth meaning is last or final; utmost. So what is it with the New York Supreme Court not being the highest court? 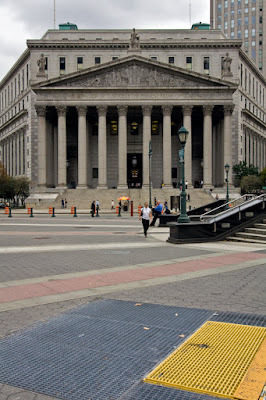 The Court of Appeals is the highest court in New York. Go here for a court structure chart. Enough carping for now. Let's just admire this building for awhile. True it was built in 1925, in a decidedly retro style, but I think I'm okay with my government buildings being classic. Go here for architectural details.